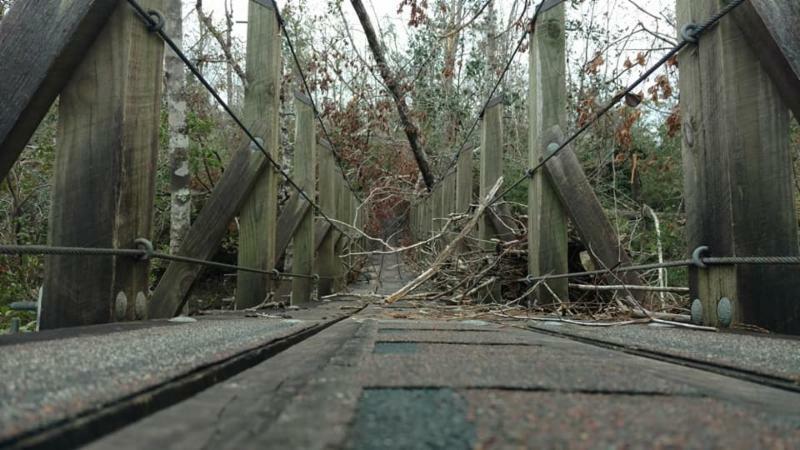 By now, the FTA community is well aware of the tremendous damage done by Hurricane Michael to the Econfina Section of the Florida Trail. 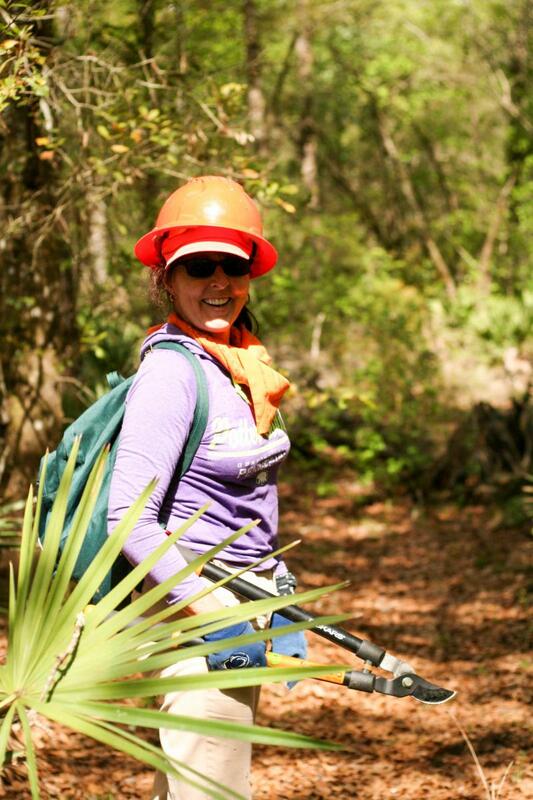 On March 1-3, the Panhandle Chapter hosted the first major Volunteer Work Party to tackle this section. 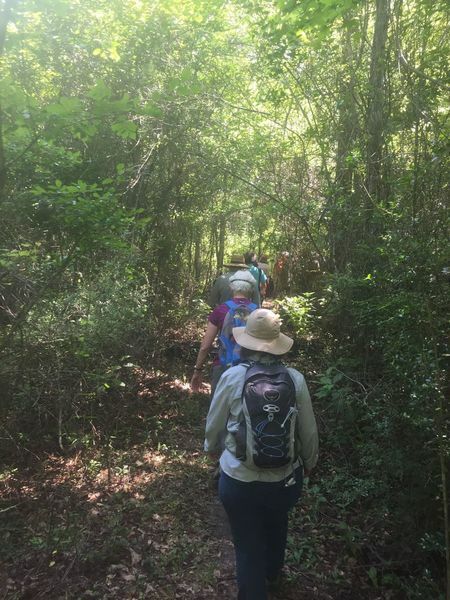 The scale of the challenge facing us quickly became clear; over two days, with 6 sawyers split between Econfina and Chipola, the crew was able to clear almost 1 mile of trail. The progress is slow and painstakingly difficult; the trail is often buried under 6+ feet of accumulated blowdowns and brush, all of it tangled into a complex and dangerous web of hidden tension and pressure. Great care must be taken to guarantee the safety of our sawyers, as a single cut can dislodge and shift the entire mass of fallen trees. 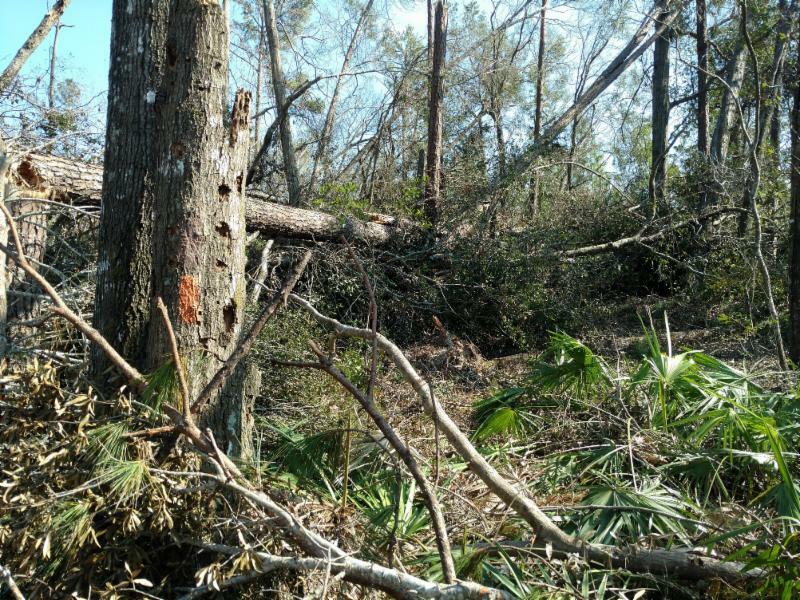 Following this first attempt, the US Forest Service (USFS) was able to secure the help of a professional sawyer team for a ten-day hitch at Econfina. 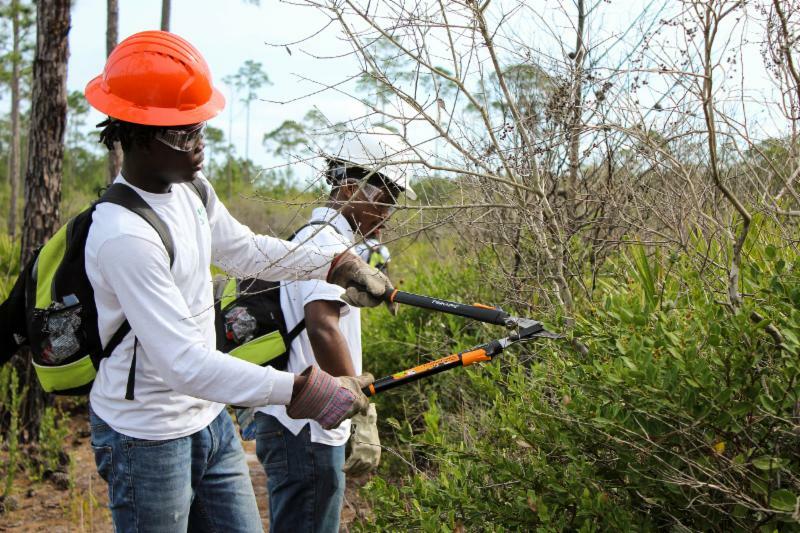 The USFS sawyers were joined by our partners from Framing our Community (FOC), fresh off their most recent project of building a bridge across Alaqua Creek in Eglin. 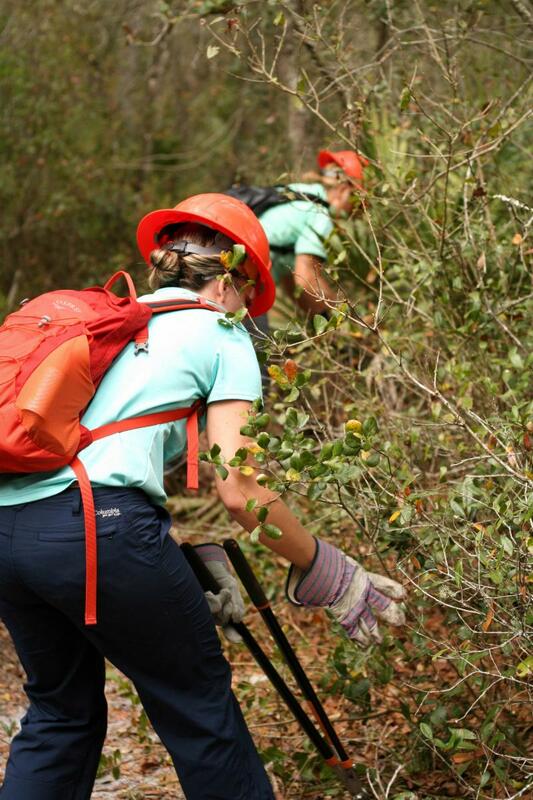 We put the word out for FTA sawyers to join the team, and for the past two weeks this exceptionally skilled crew has been making steady progress at clearing the trail south from the Scott Road trailhead. 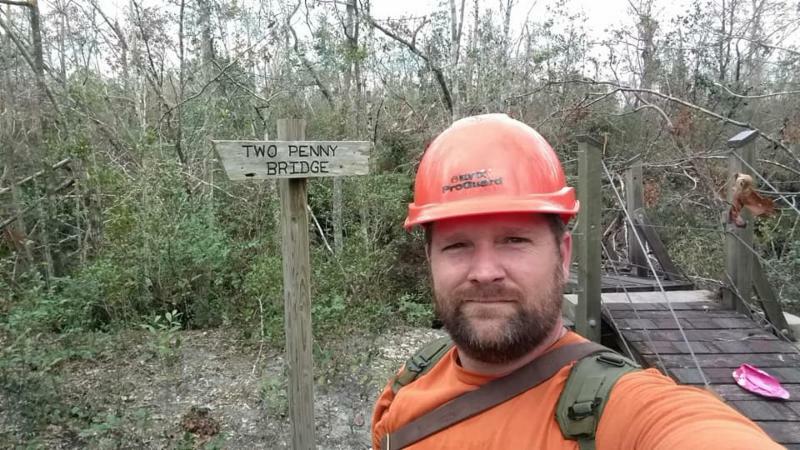 As of April 1, the trail is clear down to Two-Penny Bridge and onward to just short of Fender Bridge, a distance of almost 5 miles. We’re happy to share that day-hikers and local trail users once again have access to this popular section of trail. Our goal for the rest of this season is to clear the trail down to the road crossing at Walsingham Bridge, another 5 miles further to the south. At this point we’ll have a clear walking route across Econfina for next season’s thru-hikers, a tremendous accomplishment that was almost unthinkable when we first began to chip away at this project. Many thanks to our dedicated volunteers for their endless energy and enthusiasm when faced with this difficult work, and a special thanks to Eric Lewis and Tom Daniel for their help in scheduling the maintenance events and recruiting FTA volunteers to join the crew. 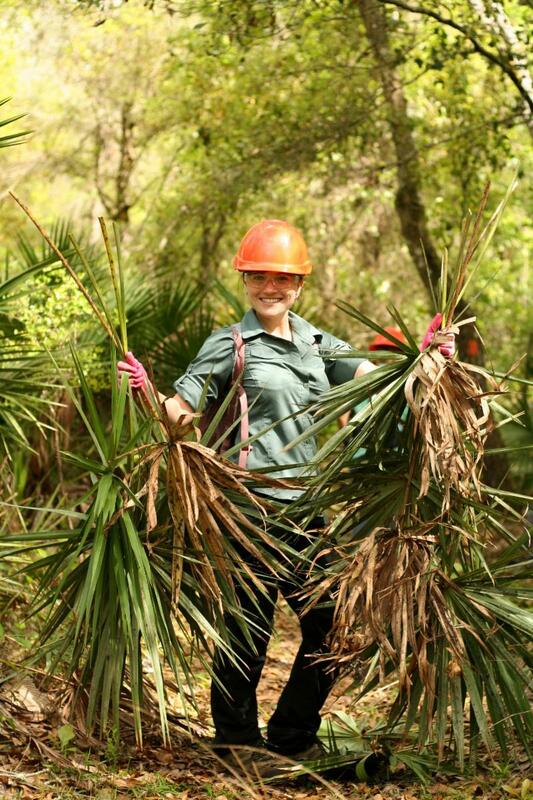 Of course, we also owe a tremendous thank-you to our partners at USFS and FOC for their assistance with this project. Working alongside these experienced professionals has been a fantastic opportunity for our sawyers. 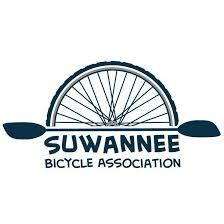 Keep your eyes on the Panhandle Chapter’s Meetup page for additional opportunities to volunteer! FTA and FOC will be scheduling additional work days in the near future. 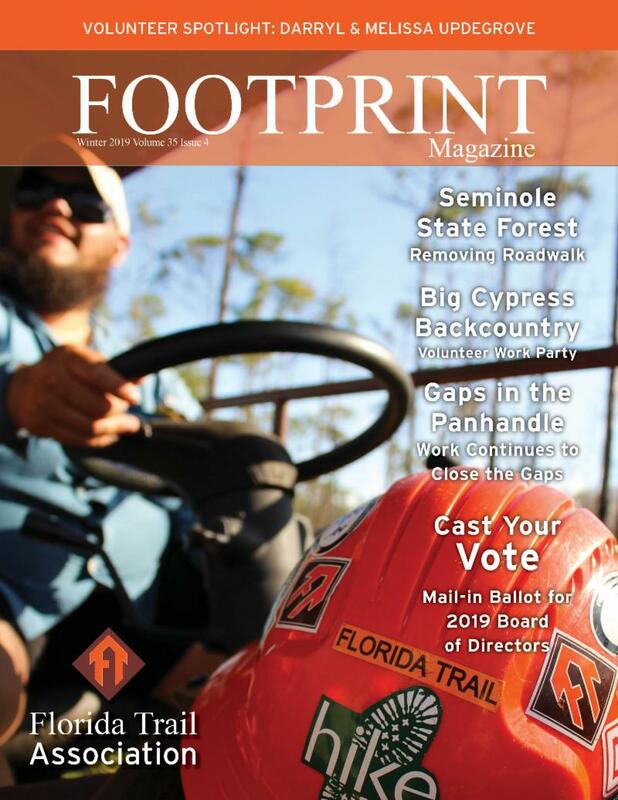 Our latest edition of the Footprint is now available! 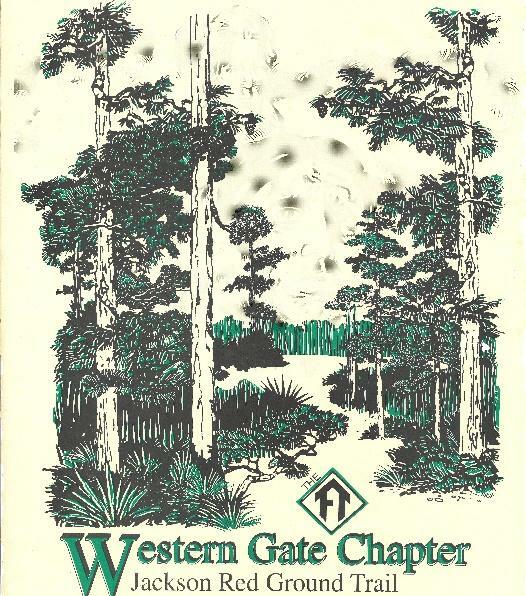 This edition includes: photos of the recent Big Cypress Backcountry Work Party, historical to present perspective on statewide trail projects, a Volunteer Spotlight featuring Panhandle Chapter Members, Darryl & Melissa Updegrove, and more! Our team has worked hard in compiling this edition and feel proud to share these FTA narratives with you. Please enjoy! 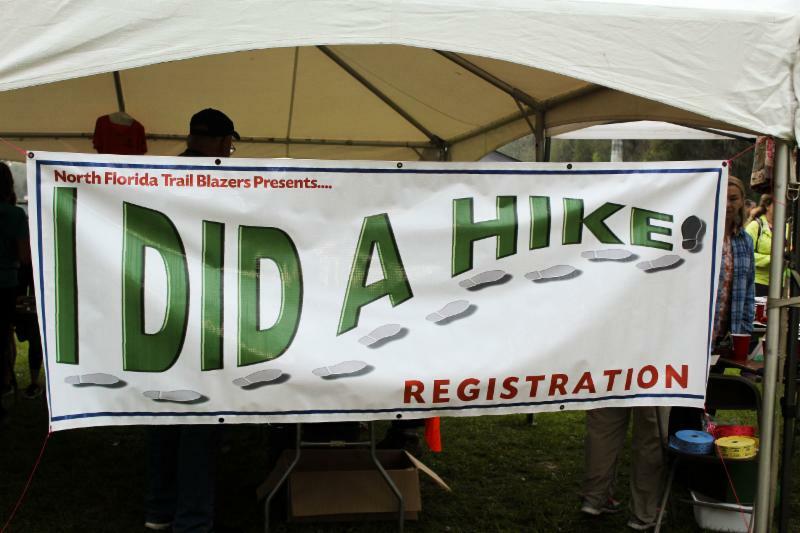 On Saturday, March 2nd, the North Florida Trail Blazers Chapter hosted the 11th Annual Ididahike at Spirit of the Suwannee Music Park. 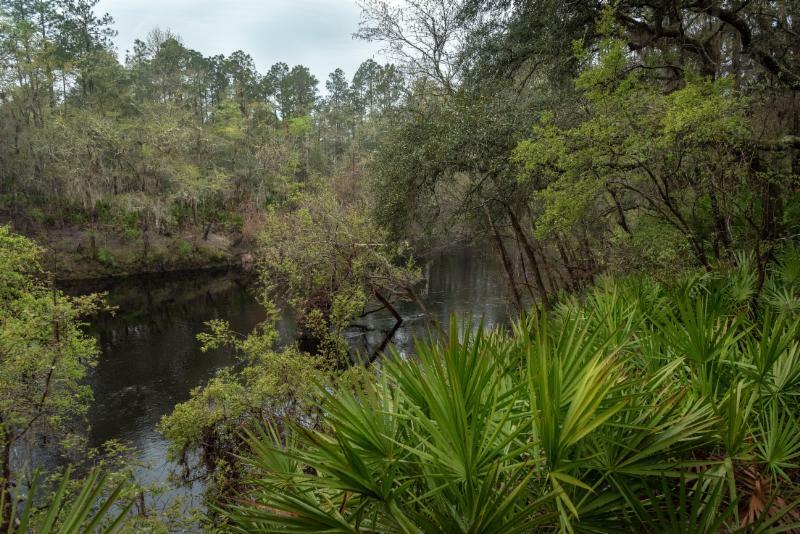 This year, the 11-mile hike explored a section of the Florida Trail along the historic and beautiful Suwannee River, with well-organized first aid and take-out stations provided for hikers along the way. 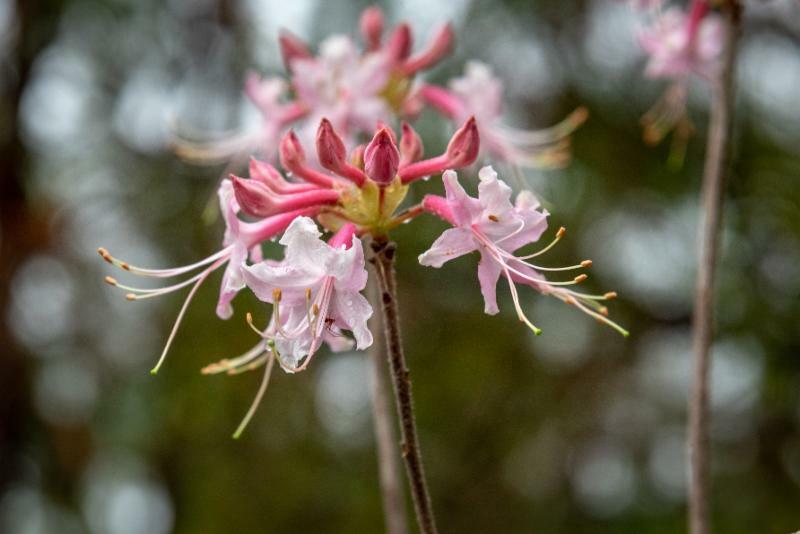 Dogwoods, wild Azaleas, fringe flowers and many others were in full bloom that weekend. 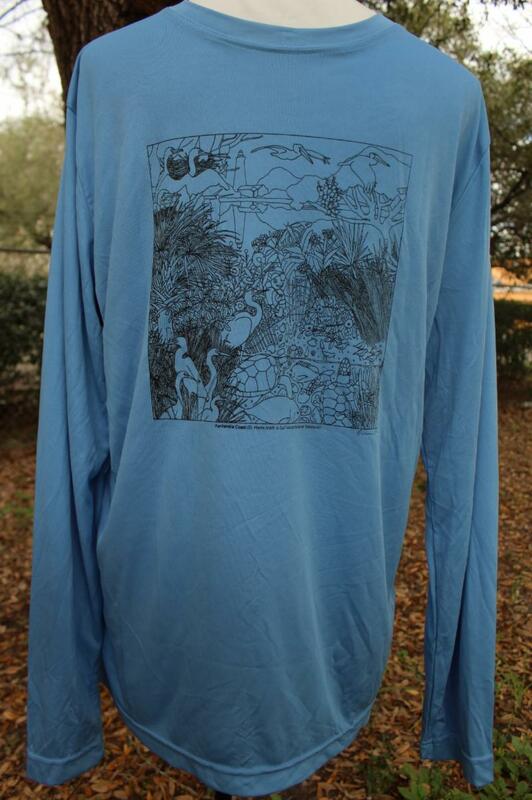 Some of the gorgeous, iconic features of this landscape included Jerry Branch, Disappearing Creek and Crooked Branch. 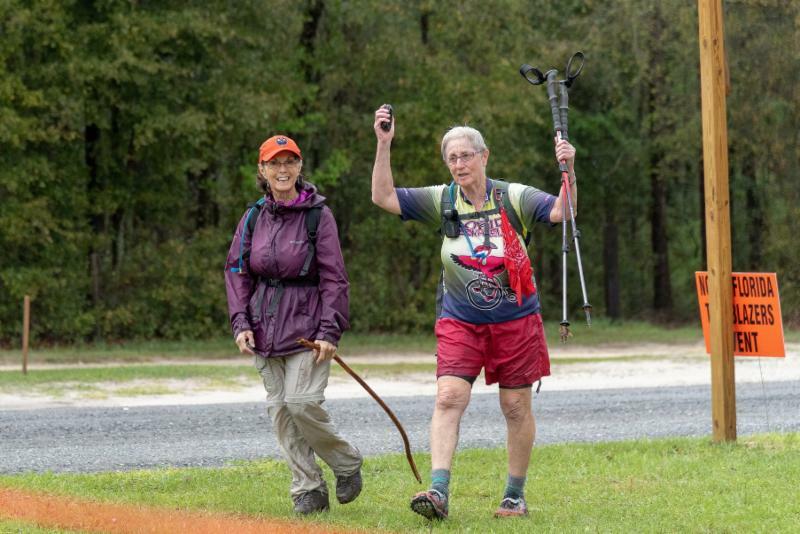 In spite of the all-day rainy weather, Ididahike was another great success this year with an attendance of over 220 hikers. 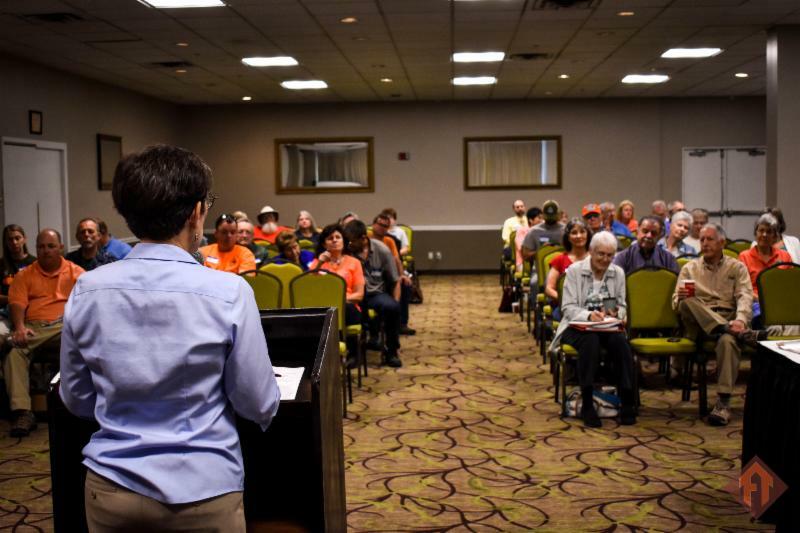 Most notably, members from multiple FTA chapters throughout the state also attended. 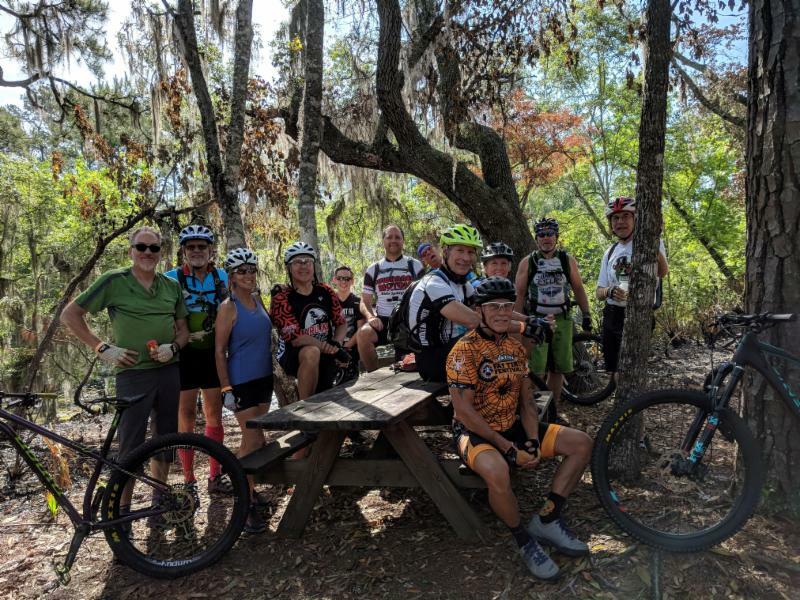 A tremendous thank you to the North Florida Trailblazers Chapter and their enthusiastic, selfless efforts in coordinating this community-cultivating event. From running shuttles, providing aid stations, coordinating registration, hosting the raffle and FTA store, to our FTA President Leslie Wheeler sharing the significance of Ididahike during the shuttle rides… these incredible FTA volunteers whole-heartedly dedicated themselves to making this a safe and valuable event— and that energy was palpable to all who attended. 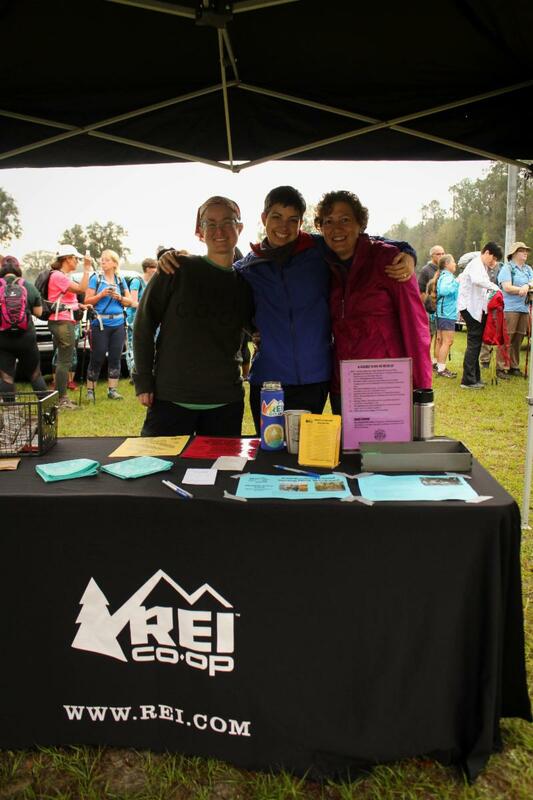 We’d like to give a special shoutouts to Trail Blazers Chapter Member, Randy Madison, for skillfully and successfully coordinating this year’s Ididahike (he even quickly built fires for cold hikers during the rainstorm); REI Jacksonville for their dedicated and spirited partnership and for providing delicious giveaway snacks; and Girls Who Hike for recruiting a solid crew of inspiring outdoors-women to participate in hiking the Florida Trail. 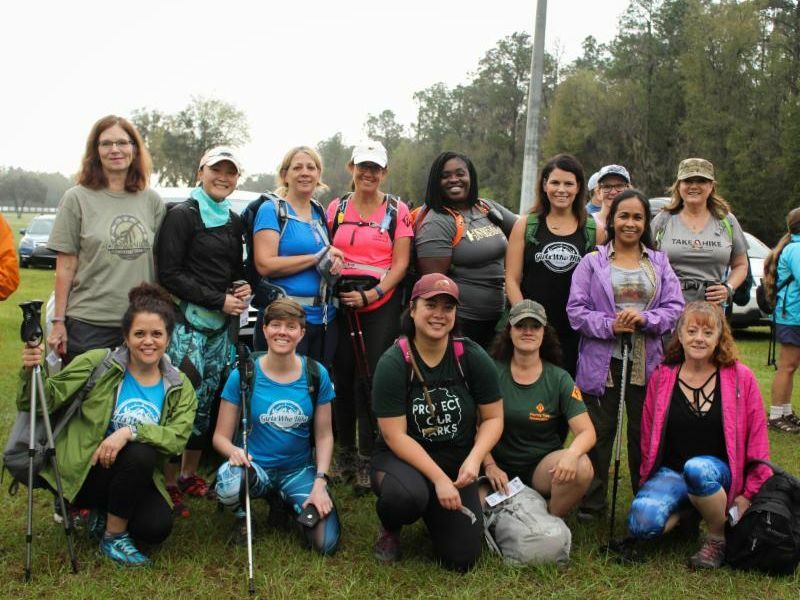 For more photos of Ididahike 2019, visit the North Florida Trail Blazers Meetup Page. 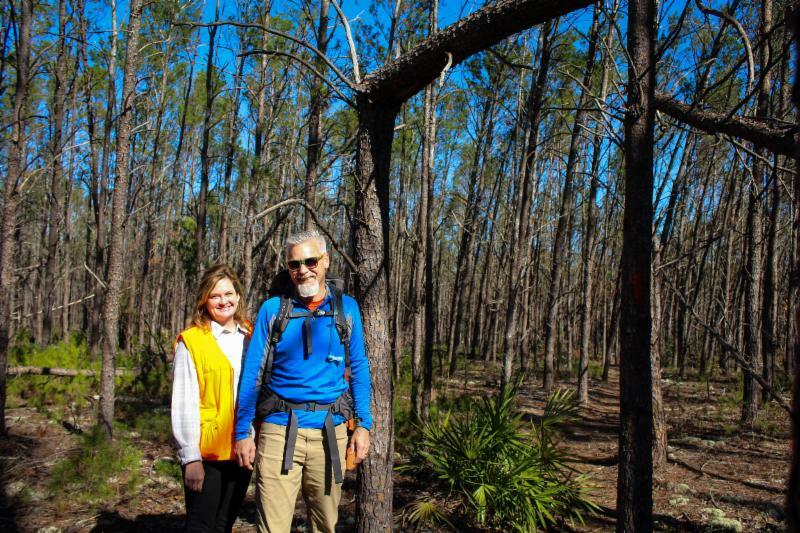 On March 13th, North Florida Trail Program Manager, Jeff Glenn, and I hosted our second annual trail maintenance event with Groundwork Jacksonville‘s Green Team in the Juniper Prairie Wilderness. 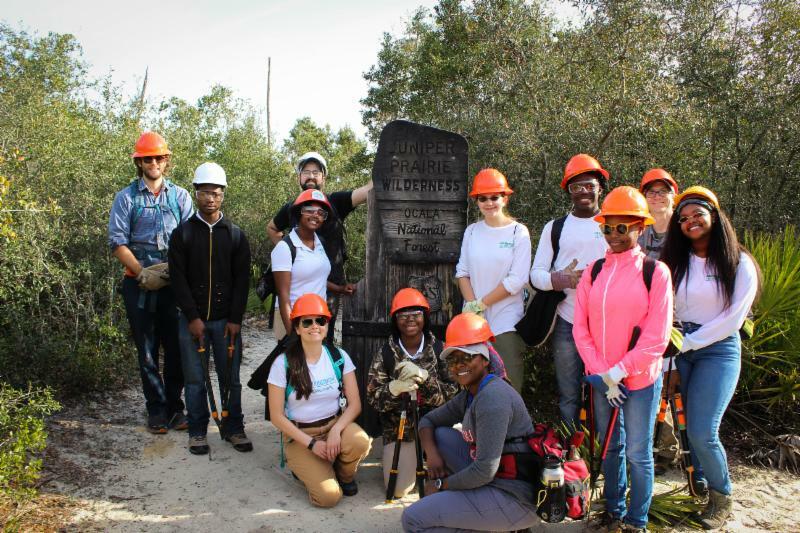 Groundwork Jacksonville is a non-profit organization working to restore, connect and revitalize the historic neighborhoods of Jacksonville’s urban core. 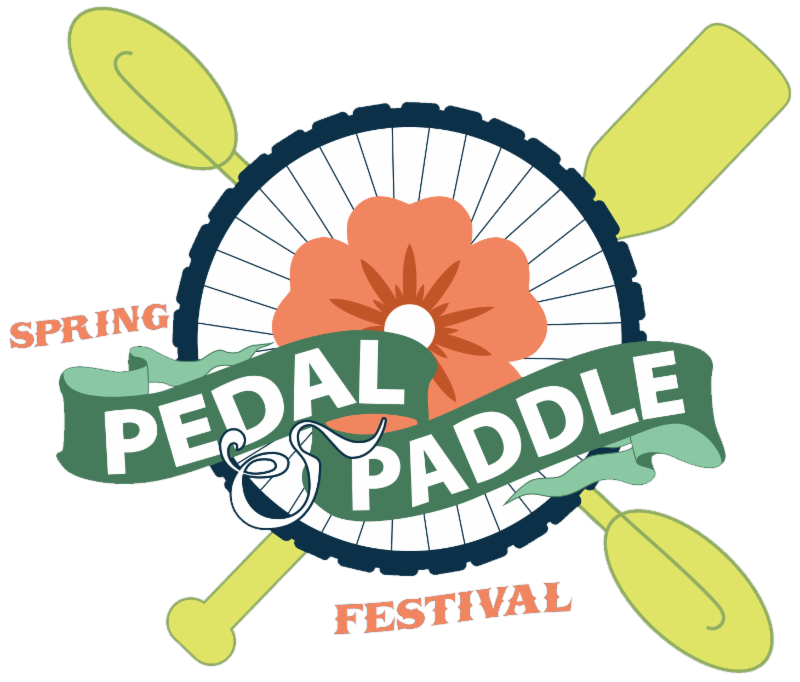 The organization is committed to environmental restoration of the urban parks, trails and waterways that make up the city’s Emerald Necklace. 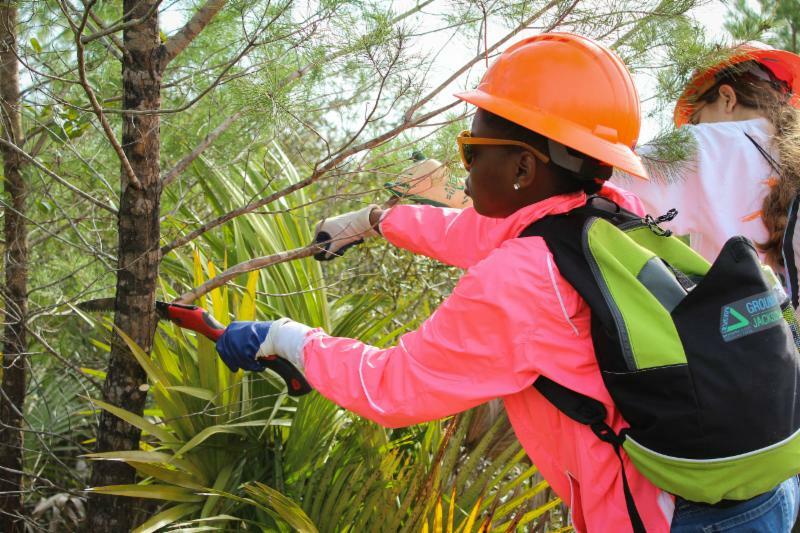 They engage neighboring communities, including young people, to fulfill this mission. 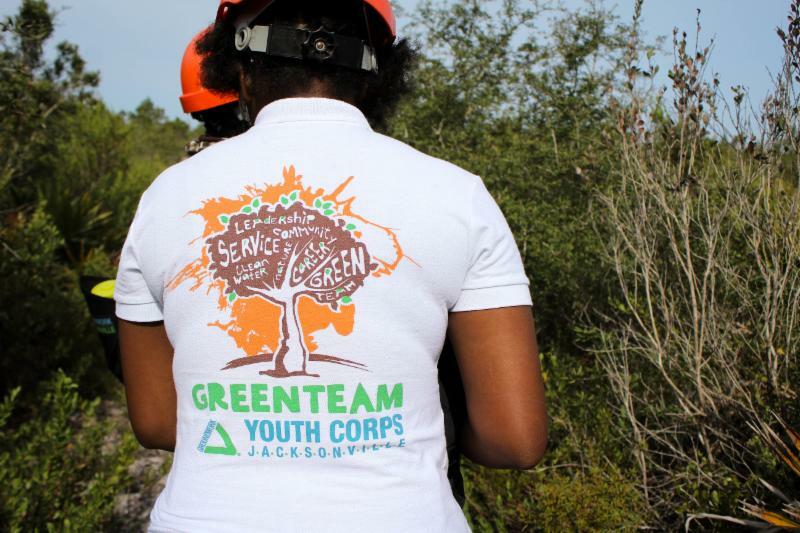 One of Groundwork Jacksonville’s successful youth programs is the Green Team Youth Corps, a year-round program that offers apprenticeships and fellowships to high school students from the city’s urban core neighborhoods. 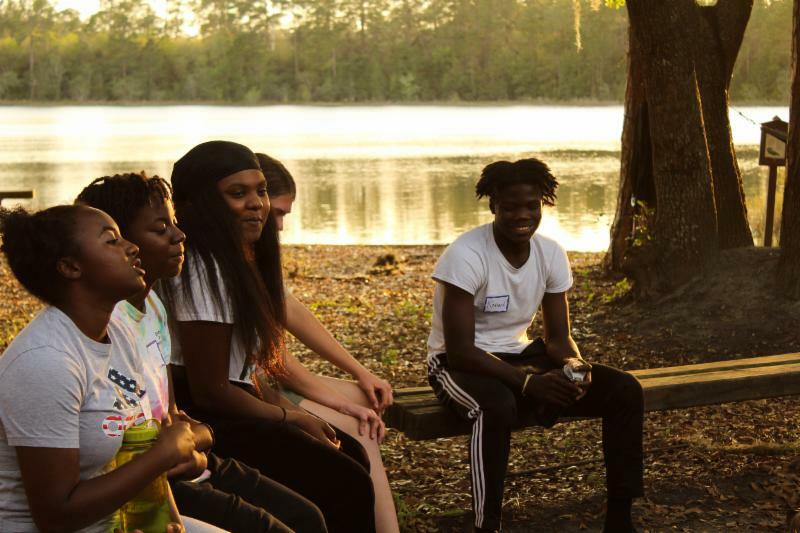 The program works to prepare Jacksonville’s youth for a lifetime of environmental and healthy community leadership as well as invest in their community’s future and capacity to improve its physical environment. 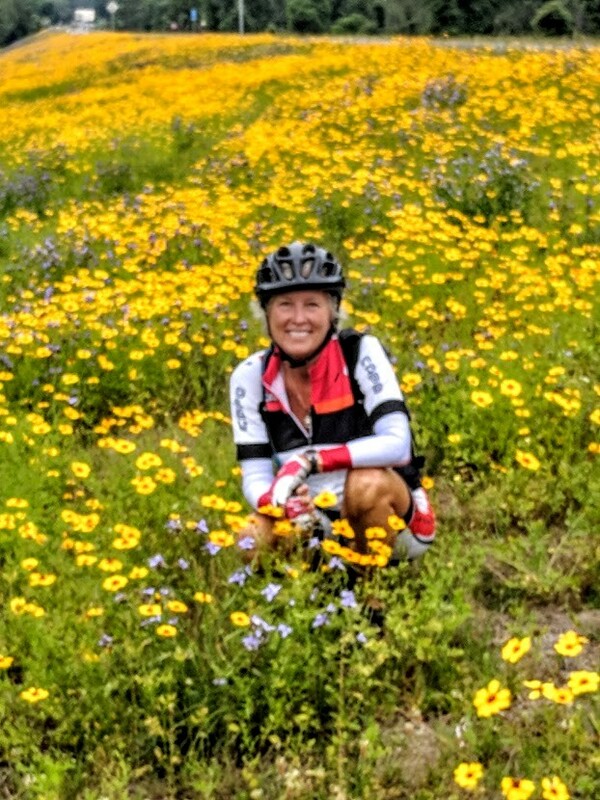 Jeff and I collaborated with their program coordinators to incorporate another morning of trail maintenance into the Green Team’s annual overnight camping trip in the Juniper Prairie Wilderness. 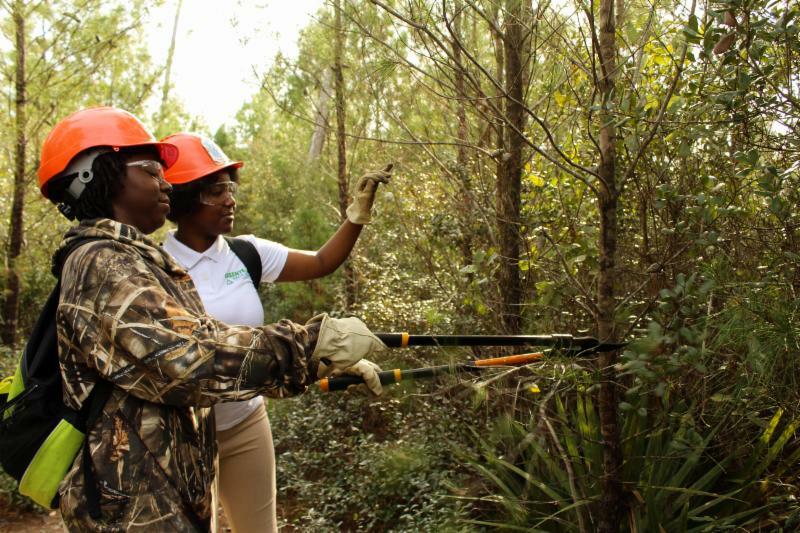 The passionate Green Team apprentices learned about the unique ecology of the area and how to clear the Florida Trail corridor in the Wilderness using hand tools. 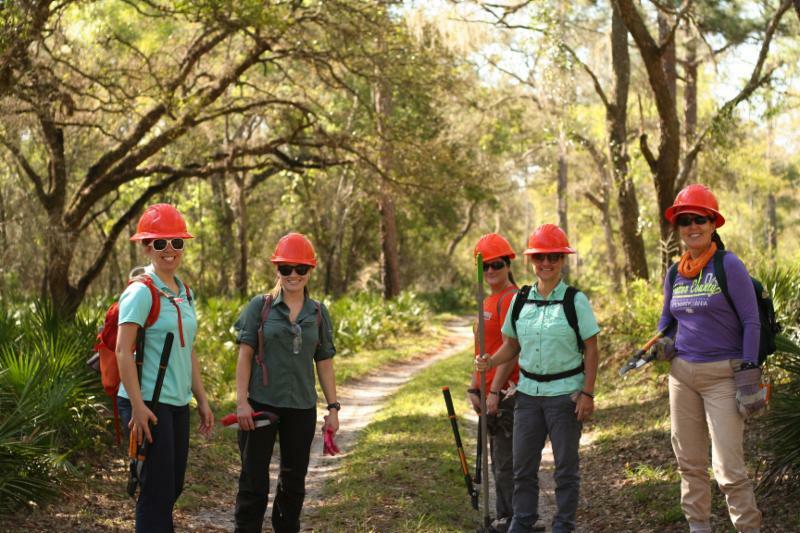 Following trail work, the group met with representatives of the Ocala National Forest and explored career opportunities with the Forest Service. 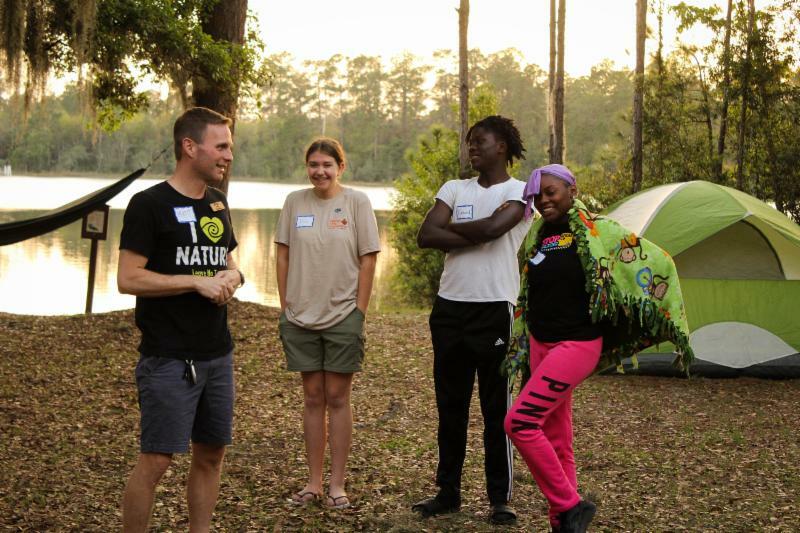 Through coordination with the FTA, the Green Team closed out their evening with a fun and engaging workshop on Leave No Trace (LNT) ethics led by enthusiastic instructors of LNT Traveling Trainers. 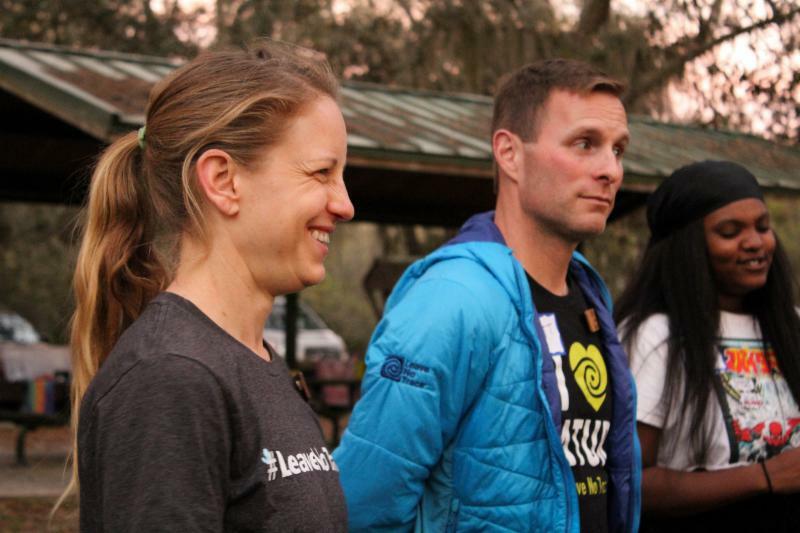 Thank you Groundwork Jacksonville and Leave No Trace Center for Outdoor Ethics for a great and inspiring day. 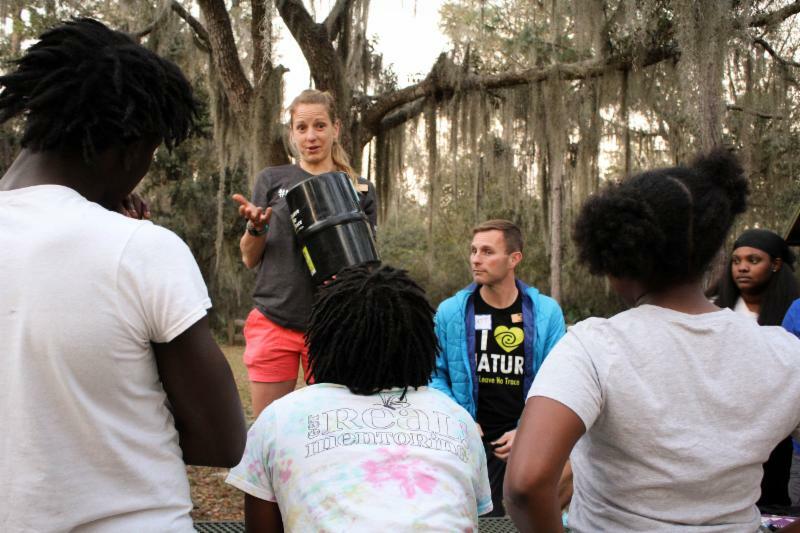 It brings tremendous hope to see today’s youth aspiring to be environmental stewards. 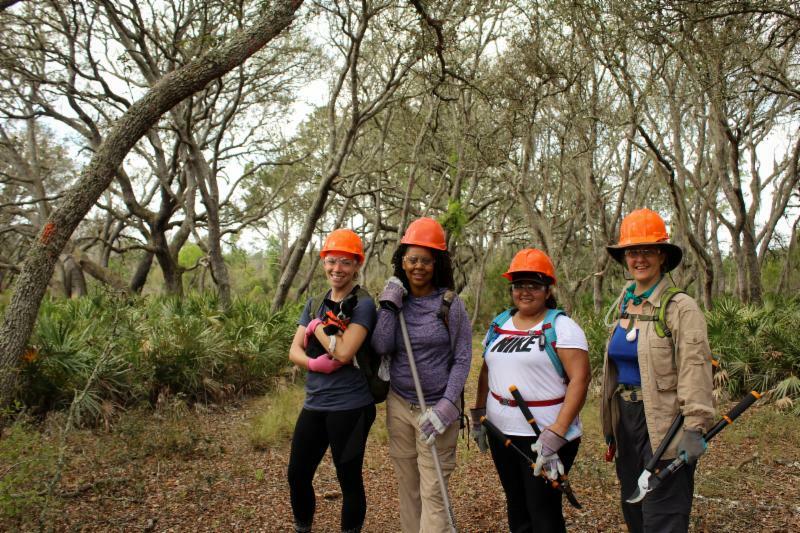 On March 8-10, Central & South Florida Trail Program Manger, Kelly Wiener, and I hosted our first volunteer work party with a new partnership group, Girls Who Hike FL. 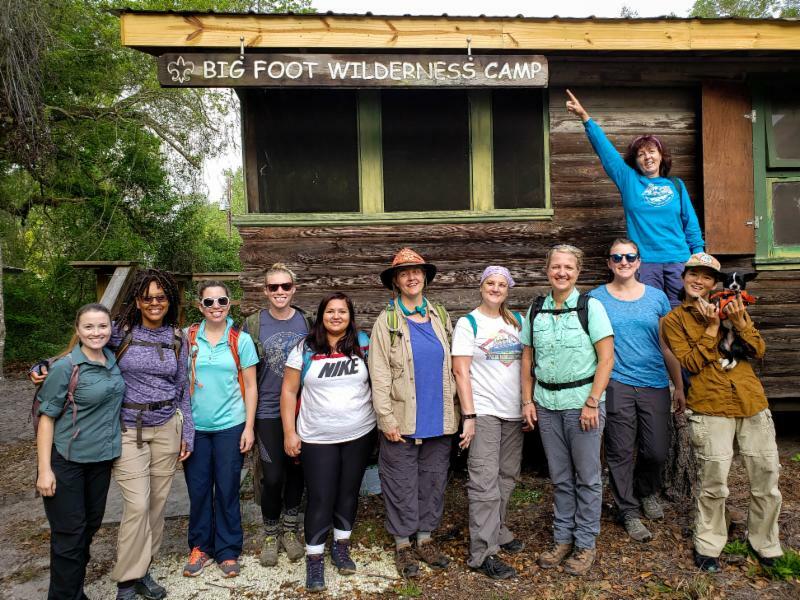 Girls Who Hike FL is a Meetup group started by Angie Vasquez to unite women of all ages and backgrounds to get out on the trails and explore Florida together. 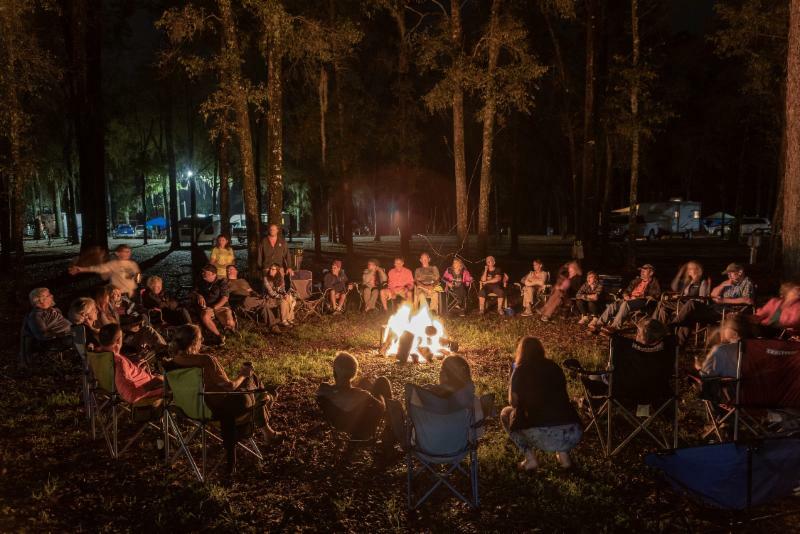 Through coordination with Suncoast Chapter members, Ralph Hancock and Lou Moser, we were able to enjoy a comfortable time camping at the Big Foot Wilderness Boy Scout campground. From clearing the trail to laughing and playing word games around the campfire, we had an amazing time with this crew. 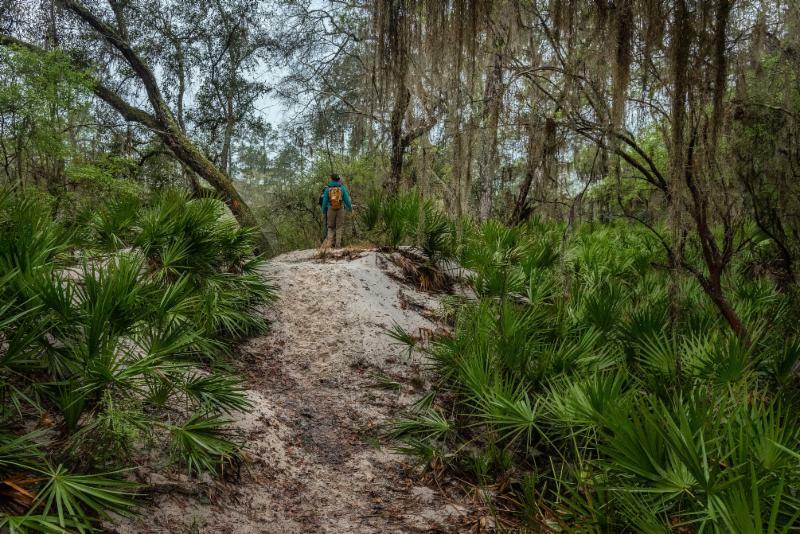 In a day and a half, we cleared a total of 10 miles of the Florida Trail in Green Swamp West. We’re looking forward to planning more events with this inspiring group in the near future! 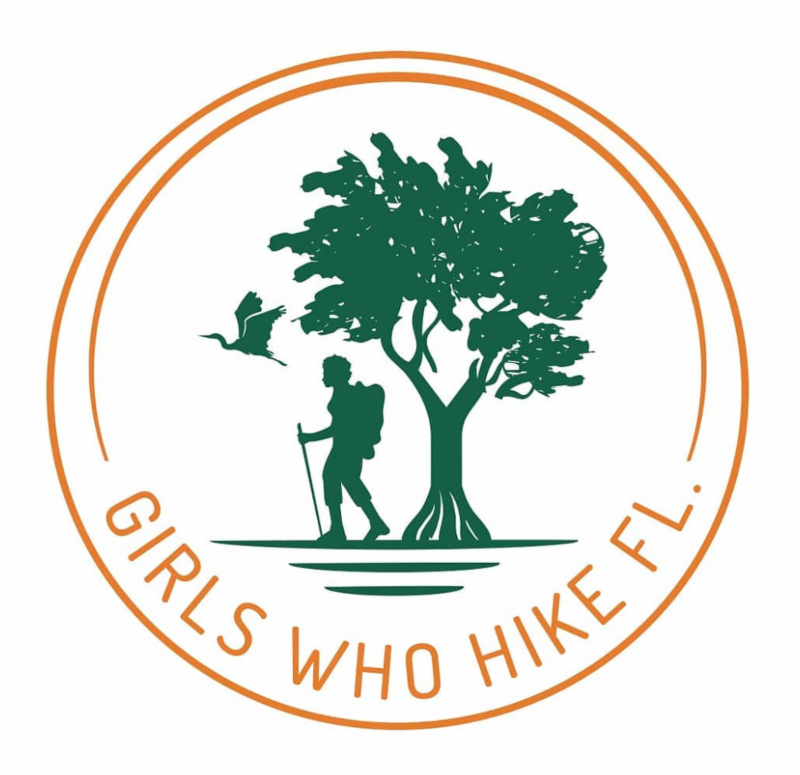 Thank you, Girls Who Hike FL! 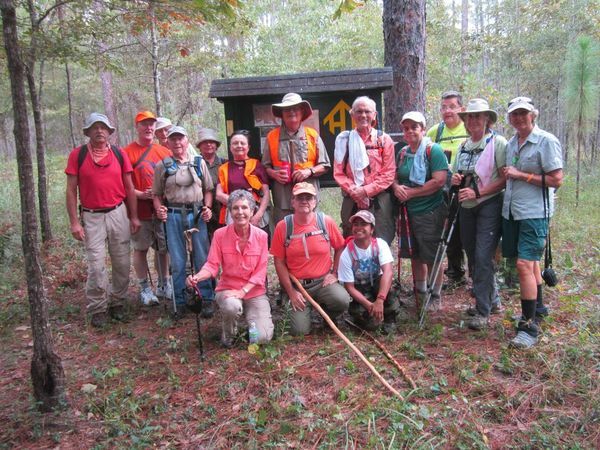 And a very special thanks to Ralph Hancock and Lou Moser for coordinating the trail maintenance, weekend logistics and shuttling with us. 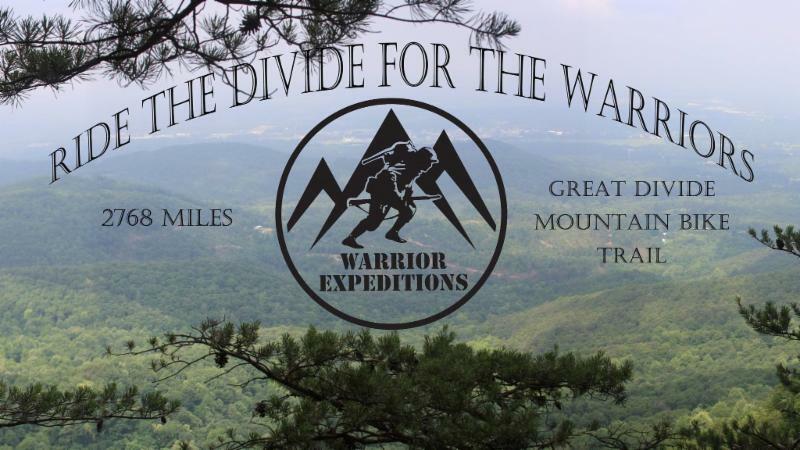 I first learned of Warrior Expeditions in 2014, shortly after joining the FT Program staff, and I immediately connected to their mission. I came from a professional background of leading people on multi-day backcountry expeditions. 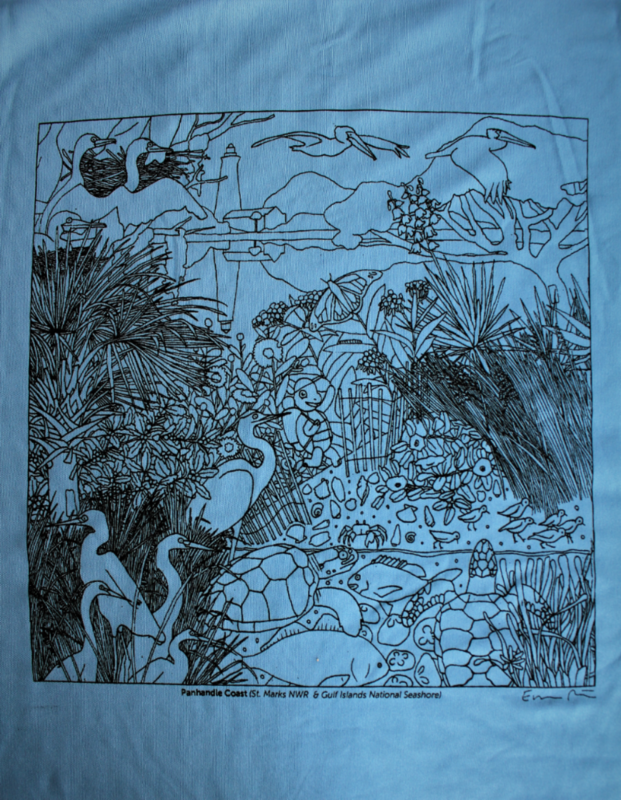 I saw first-hand the transformative effect of time spent outdoors. I believe nature can bring out the best in people. Time spent away from roads, electricity, and commerce challenges us with new perspectives that inspire positive changes to our lives and communities. This is the basic premise ofWarrior Expeditions. 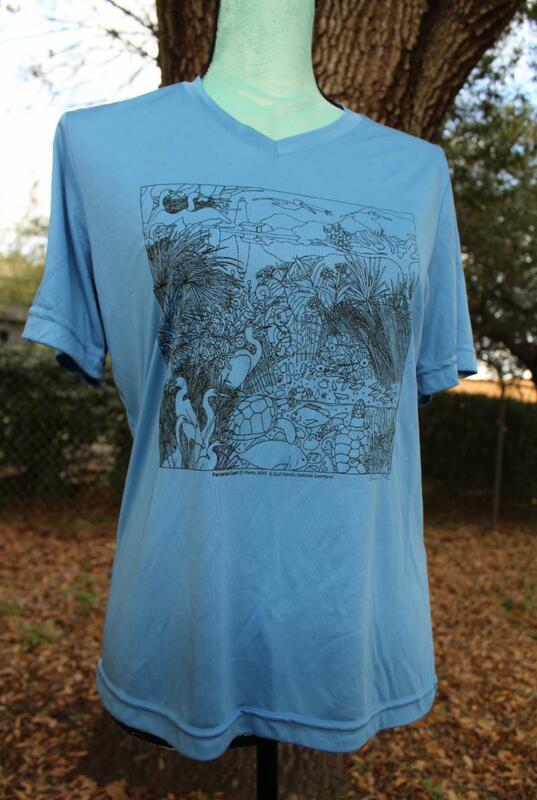 To make a tax deductible donation, please visit the link below and click on the donate button. 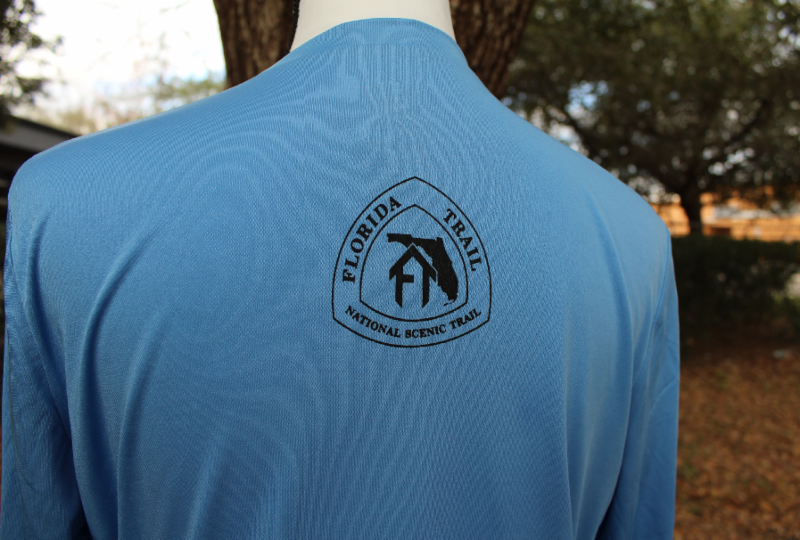 Also, please click on the “add special instructions to the seller,” and enter “FTA” so that the members of the Florida Trail Association can be recognized for their support.